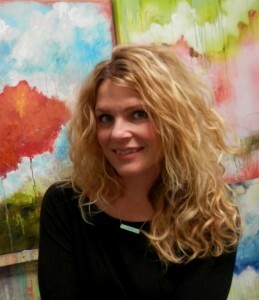 Jennifer is an Abstract Expressionist painter known for her vibrant and ethereal work. She grew up in the small, artsy town of Lucas, Kansas. Lucas is quite the inspiration for Jennifer, as the arts, specifically, ‘Grassroots’, art is widely prevalent and played a large roll in her pursuit to become a professional artist. With the use of bright, bold color, texture and references to nature, she paints pieces that allow her to share stories largely inspired by her surroundings. These stories share one common thread…happiness. Happiness is woven through all of her work and flows across the canvas just like the brightly colored paint she uses. It is important for Jennifer to pay homage to the simple beauty of everyday life and share her joy for life itself. Her work has been featured in several publications and is in many private and corporate collections both locally and nationally including Bishop-McCann,Waddell & Reed and University of Missouri, Kansas City.